It was a big night for area photographers as winners were announced in the Annual Brookings Arts Council Photography Competition. In excess of 50 people were present as Elicia Holien, of Watertown, received the 1st place designation for her color image titled, ‘It’s Not Fair’, as did Sioux Falls photographer Brenda Stough for her BW image, ‘In the Fog’. Both photographers received a $75.00 check for their first place designation. Second place in the color division went to Jon Sprang of Brookings, for “Serenity” with BW going to Sherri Stormo of Watertown for “New Department”. Both received $50.00 checks for their 2nd place designation. Janine Kentfield of Garretson won third place in the color division for her piece “Attitude” and BW winner was Haley Hanson, Badger, with her piece, “ Camden Market”. Each received a $25.00 check. Color: Quin Paledini (Watertown) for “Marked” and Jeff West (Brookings) for “What Remains”. BW: Brenda Stough (Sioux Falls) for “Bleak” and Vickie Prussman (Volga) for “Superior’s Fury”. Our online People’s Choice digital submissions competition will continue until Feb 1 at 5pm with the winner announced by Feb. 5th. Go to our website: www.brookingsartscouncil.org, Fine Art Photography tab to find the drop down item that will take to you to all submissions. This is a wonderfully eclectic exhibit of photography and the public is encouraged to come and view it prior to it closing on Friday, Feb 1, at 3pm. There is no admission charge. 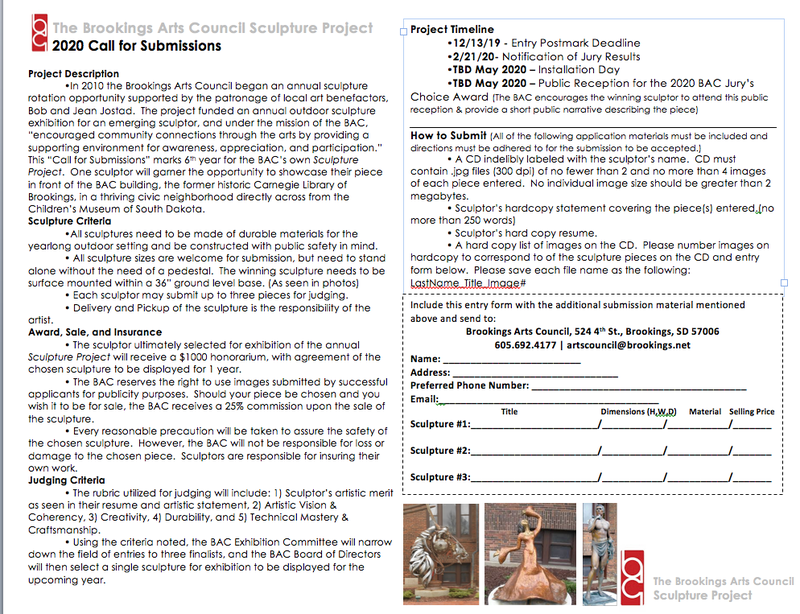 The Brookings Arts Council is open Tuesdays through Saturdays, 12 to 5pm.